We're probably going to do what we do most New Year's Eves, which is enjoy a homemade feast of lobster tails, champagne and oysters on the couch in our pajamas. Something good from Netflix streaming on the TV. No traffic. No running around in the freezing cold trying to find a cab. 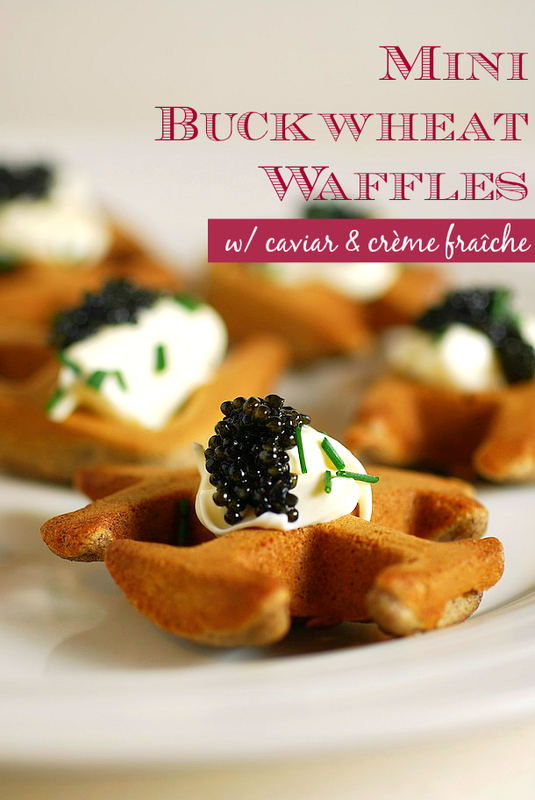 Mini Buckwheat Waffles with Crème Fraîche and Caviar! 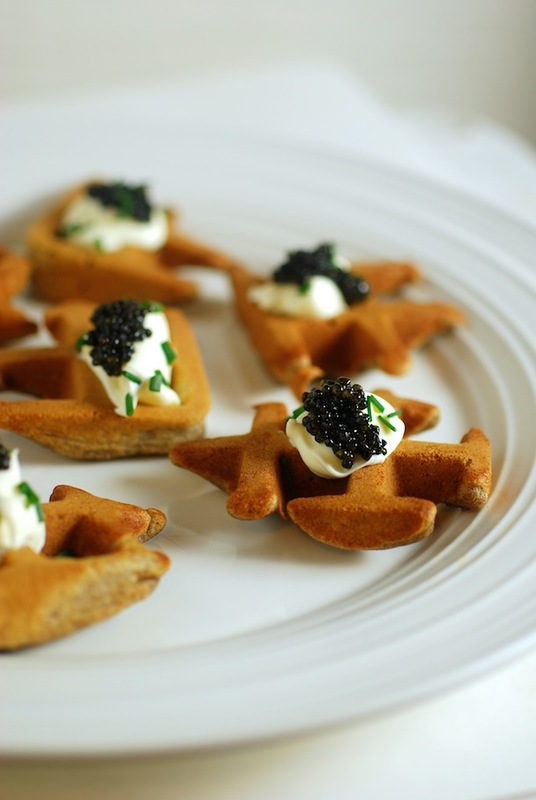 Even though we stay home on New Year's we like to go all-out when it comes to our menu. For us, that means lobster tails and real champagne. And this year? Black caviar. I love those tiny, salty little beads. Traditionally served on buckwheat blini (mini pancakes), this year I got the idea to play around with my new waffle maker and make tiny waffles. I used a buckwheat mix from Arrowhead Mills (Bob's Red Mill also makes a good one), and prepared the batter, then spooned it in small 1/4 amounts around the waffle iron. The results were these funky shaped waffle bites that were perfect for topping. Smoked salmon would be a lovely substitute, or you could do horseradish cream and slices of grilled flank steak. If you prefer to keep it vegetarian, an herbed cream cheese would be wonderful. Or you could do something a little sweet, with pear and blue cheese or figs, goat cheese and honey. Make your own homemade creme fraiche! I definitely encourage you to take the presentation idea, and have fun with it. Prepare one cup of the mix according to package directions. Preheat your waffle iron, then spoon 1/4 amounts of the prepared batter around the base of the waffle maker, leaving about 3 inches between each scoop. Close and cook waffles according to machine directions.